Set a decade after the U.S.S Voyager's return to Earth, a rag-tag crew of renegades and outcasts must covertly work with Admiral Chekov and Tuvok to stop forces threatening the Federation from outside, and within. The further adventures of the crew of the USS Enterprise. Various retired leaders discuss their experiences of the Four Years War, a war between the Federation and the Klingons, and the build up to a battle at Axanar that caused a major turning point in the war. The Dirty Dozen goes interstellar in this exciting new ongoing Sci Fi series about a group of rogues, rebels, and outcasts who try to stop forces threatening the Confederation from outside, and within. Not for the uninitiated, But a fun ride. Nichols (no relation) carried the lead well. She reminded me how much I wished that they had done more with her character back in the day, but the politics of the time wouldn't allow. A tad heavy on the "geek stuff", but as they said, it was dedicated to the fans. (I wonder if the whole idea started with two geeks arguing about who would win in a fight between Gary Mitchell and Charlie X.) Still, when it comes to geeky nit-picking I should be the last to throw stones. 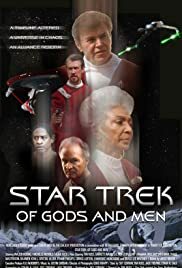 I thought Uhura and Mitchell never met, but I guess you could fudge it (as with Chekhov and Khan,) and say that they were aboard the Enterprise but had yet to be promoted to bridge crew. Still, I shouldn't have to work that hard. And that thing about the Guardian failing to insulate our heroes from the time line change, had they been able to follow Charlie through the gateway they still would have been powerless to stop him and we would have no story. Did the Guardian know this and let them be transposed, but protect their memories? The FX were amateurish, decent models but they didn't move right and the rendering was poor, Still the climactic battle was a guilty pleasure for anybody who played "Star Fleet Battles" way back when. With all it's flaws It still mops the floor with many "official" episodes and almost all the odd numbered movies. It will have to hold me over 'till the new movie comes out. I am a little disappointed that Abrams isn't geeky enough to have a before-the-transformation "good guy" Gary Mitchell riding along with Kirk, but hopefully Uhura will finally get her due. She was the reason I knew that I was straight at the age of 5.